The optimal system for chopping, arranging, and serving cucumber sushi in Overcooked 2 exists only in my dreams. Lately, I’ve had those dreams a lot. Even if I’ve only played an hour of the strategy cooking game before bed, by the time I get into REM sleep I’m frantically dumping my sous-chef’s hot rice on a plate and rolling digital maki. Sometimes, accomplishing these dream tasks is satisfying. Other times, I wake up wishing I’d just dreamed about my teeth falling out. One morning, visions of sushi still dancing in my head, I turned to my partner, who had just woken up, and asked him if he’d ever dreamed about video games. It turns out that, in his dreams, events in his over-cluttered Google Calendar are often mapped onto Magic: The Gathering Arena cards, which he assiduously arranges into plays. “Sometimes there are some actual Magic cards in there too,” he said, laughing. For people who spend a lot of time plugging inputs into video games, the game doesn’t end when their head hits the pillow. The more gamers I asked, the more I learned how widespread video game dreams are. Speaking to psychologists and dream analysts, I found that this widespread phenomenon says a lot about gamers’ unconscious minds and neural wiring. “Dreams are about integrating our conscious and unconscious lives,” said psychologist Anthony Bean over a call last week. Bean was very much in the mood to talk about the work of the early 20th century psychiatrist Carl Jung, who modernized the study of dreams and believed the same dream can mean different things for different dreamers depending on how their individual lives played out. “If you see something on television and think it’s really interesting, your consciousness and unconscious are going to continue to process it and how it applies to you,” he said. And since games are by definition interactive, they have even more immersion quality than TV. What surprised me as I spoke with people who dream about games was that their dreams often were not wish fulfillment or best-case scenarios, but instead massively stressful. By far, the most common type of gaming dreams that people told me about concerned strategy and puzzle games. Jay Shah told me he dreams about the financial investment spreadsheets he made for the MMORPG EVE Online. Brett Adams told me that, in his dreams, he’s making color matches in Puzzle Quest. Lexi dreams about Tetris bricks. So does Ted. Matt dreams about tactical simulations in Fire Emblem, and Josh dreams of Final Fantasy Tactics. It’s not that these dreamers were simulating specific gameplay problems and solving them with the same detailed mechanics they would when actually playing the game that day. 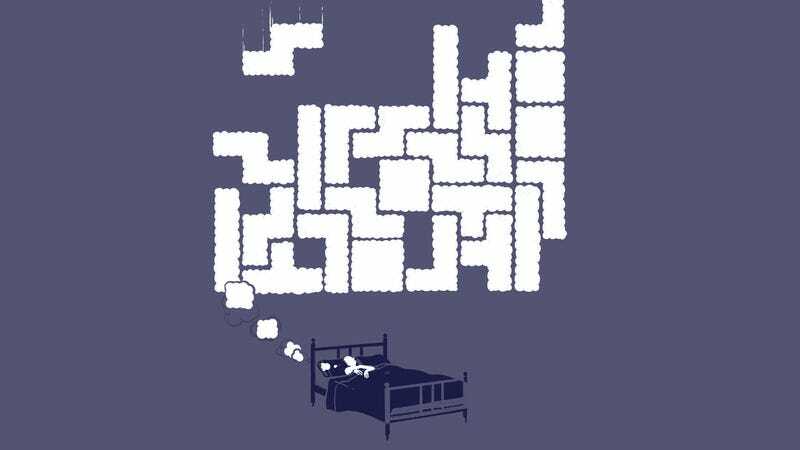 Often, the in-dream Tetris puzzles were just blurs of color. Shah’s spreadsheets were “definitely gibberish.” Strategy game dreams seem to be more about problem-solving in the most general sense, which is what I experienced with my Overcooked 2 dreams—and before that, dreams about the Switch strategy game Into The Breach. Rachel Kowert, a psychologist who specializes in video games and runs the analytics firm Kitsune Analytics, says that dreaming about strategy games in particular might mean something beyond simply processing what you’ve done that day. Kowert also said that dreams function to help people remember their waking lives, which is why your dream about Magic cards might also have Google Calendar overlaid on them. “Games are organized things we play, and if that helps you organize memories from your day, it makes sense they would be superimposed on that,” she said. “Often your dreams will process these issues without reference to the game itself,” she said, “using different symbols and different dramas.” Once you wake up, you might find yourself better at the game even if you don’t realize how it happened. “When you ‘sleep on it’ you often wake up with the solution to the problem even if you don’t remember the dream,” she said. Formal studies on how gaming affects dreams, and on how gaming-related dreams impact our daily lives, are few and far between. Although there’s no data-driven evidence that says what my anecdotal research has found—that strategy games are very popular dream fodder—there are studies corroborating the idea that gamers dream differently from non-gamers. According to research by Jayne Gackenbach, a psychologist at MacEwan University in Edmonton, Alberta who specializes in lucid dreaming, gamers are more likely to report having lucid dreams, or dreams in which the dreamer has a high level of control over what happens. People who play a lot of video games seem to have a special talent for disarming violent situations in their sleep, like kicking a gun out of an aggressor’s hands, Gackenbach said. In one study conducted with veteran gamers who struggled with PTSD, -a demographic highly susceptible to nightmares, the subjects were more capable than the average person of getting through hardship scenarios in dreams. Unlike in a real-world war, in which a soldier’s not terribly sure whether they’ll live or die, gamers in games only face digital repercussions for their decisions, which can be empowering when translated into dreams. That sense of dream agency can also come from role-playing games, or any sort of “hero’s journey” where the player is hyper-powerful and has total control over their actions. In real life, we can’t just swing an ax at a brick and destroy it, enter every home we pass, run twenty miles, and then defeat a gargantuan dragon. Exercising that level of control is the stuff of dreams. When psychologist Bean talks to his therapy clients about their personal lives and personal goals, he said he always asks them about where the “hero component” is. Dreams aren’t just random movies played by your brain. They’re all somehow meaningful, although that meaning isn’t always clear. If you dream about Ganondorf, maybe he’s your dad. Maybe he’s you. Or maybe he’s just Ganondorf and your brain is telling you it wants to play Ocarina again. One thing’s for sure: I’m no closer to figuring out why I dreamed about grabbing the fire extinguisher when I meant to grab the pizza in Overcooked 2.